the way toward a more connected and aware society. Fun fact: Aquarius rules the tool and practice of astrology. With the Sun being in Aquarius until February 19, your energy will be gravitating toward group endeavors and shared causes, with much of the collaboration happening thanks to new or renewed friendship. new that winds up benefiting society. Fiery passion isn’t their driving force, an overactive mind is. Write down all of your scattered, lofty ideals now and task friends to help make sense of them later. The New Moon energy welcomes the Year of the Pig, according to the Chinese calendar. Those born during a Pig year are amicable people. The earthly Pig energy of 2019 is prospected to both challenge (natural disasters) and reward (lucky earth-centered industries). Jupiter is in positive energy flow with the New Moon, giving expansive power to anything that is created. Focus on doing something that will help you, others and even the Earth grow. A Full Moon in Virgo happens February 19, bringing with it a nagging need for control and order. Peace of mind will come from doing all that you can to create and maintain structure (while letting go of the rest). if you’re not careful, however. To balance energy, the Sun is always in a sign karmically opposite to the Full Moon. Pisces is neither practical nor productive, but save the emotional, lazy streak for March if you can help it. Shop our new specially curated selection of dried herbs for incense, smudging, potpourri, and other ceremonial uses. 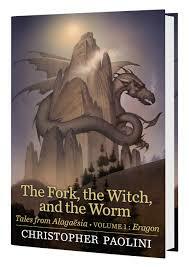 Welcome back to the world of Alagaësia. It’s been a year since Eragon departed Alagaësia in search of the perfect home to train a new generation of Dragon Riders. Now he is struggling with an endless sea of tasks: constructing a vast dragonhold, wrangling with suppliers, guarding dragon eggs, and dealing with belligerent Urgals and haughty elves. Then a vision from the Eldunarí, unexpected visitors, and an exciting Urgal legend offer a much-needed distraction and a new perspective. AVAILABLE IN-STORE at BARJON’S NOW!